HIGHWIRE Longstar delivers unsurpassed power and bandwidth over extreme distances of coax cable. Deliver unsurpassed power and bandwidth over extreme distances of coaxial cable. Cut costs and installation time by re-using long runs of legacy coax cabling, especially in rail and metro applications. 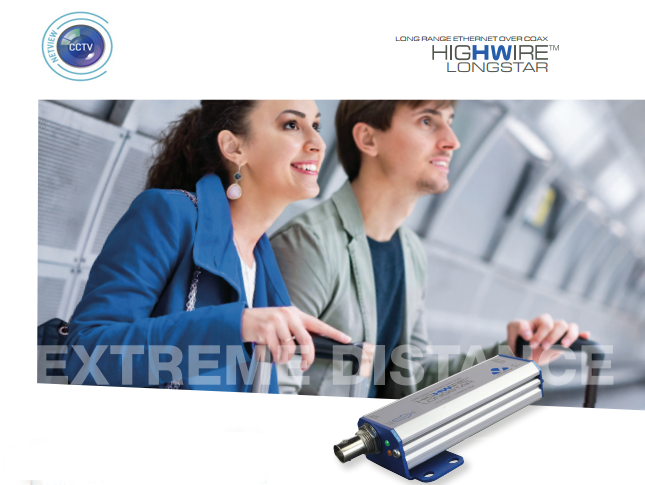 HIGHWIRE Longstar’s ruggedness and high performance is particularly suited to rail, metro and industrial applications. HIGHWIRE Longstar delivers unsurpassed distances. HIGHWIRE Longstar delivers a full bandwidth 100Base-T network signal and POE Plus over unsurpassed lengths of regular coaxial cable. It provides the reassurance of exceptional performance and reliability, while enabling considerable savings in the cost, time and risk of upgrading legacy analogue camera installations to IP. A range of 540 - 690 metres with RG-59 or even up to 1400 metres with RG-11 is supported, without compromising the 100Base-T data rate. For even greater distances it can automatically configure to 10Base-T operation, running approximately three times further with data only. Models with optional POE in or out can deliver the full 25 watts of 802.3at POE Plus to cameras over the same legacy cable. Designed for straight-forward installation, all the HIGHWIRE Longstar models are entirely self-configuring, and feature extended temperature operation, have a rugged enclosure with both wall-mount or high density rack mounting options. Used in pairs, installation of HIGHWIRE Longstar is extremely fast and efficient. The devices self-configure and self optimise on connection. No set-up or system pairings are required. Data and power connections are easily monitored during installation using the embedded LEDs. The system incorporates Veracity’s SafeView™ technology, which provides instant confirmation of link status, power level and diagnostic information. Although designed for 75 Ohm cable, HIGHWIRE Longstar will operate over 50 Ohm cable with full performance and only a slight reduction in the maximum distance attainable. POE-equipped models allow all of the power for the link to be sourced from a POE switch, POE injector or power supply, for simple installation and optional UPS backed power delivery for high resilience against grid power failures. Simple Rackmount Option Up to 24 HIGHWIRE Longstar Base units can be rack-mounted using the simple 1U space-saving bracket. Although HIGHWIRE Longstar POE models can be powered from POE switches or injectors, several Veracity 57V DC power supply options are available (see partcodes) to provide the maximum power and range performance. Veracity Power Supply Options Rack-mounted HIGHWIRE Longstar units can be powered by the Veracity 57V DC 1U rackmount power supply. This 8.8A power supply can provide enough power for up to 24 HIGHWIRE Longstar units with POE output. The power unit can be fitted behind the rack-mounted HIGHWIRE Longstars in the same 1U space, thus saving rack space. POE Models of HIGHWIRE Longstar enable both network data and power to be carried over extended lengths of new or existing coaxial cable. HIGHWIRE Longstar is also suited to new coax installations, due to the low levels of signal distortion through long runs of RG6 or RG11 cabling. Up to 24 HIGHWIRE Longstar Base units can be rack-mounted using the simple 1U space-saving bracket. Although HIGHWIRE Longstar POE models can be powered from POE switches or injectors, several Veracity 57V DC power supply options are available (see partcodes) to provide the maximum power and range performance. Rack-mounted HIGHWIRE Longstar units can be powered by the Veracity 57V DC 1U rackmount power supply. This 8.8A power supply can provide enough power for up to 24 HIGHWIRE Longstar units with POE output. The power unit can be fitted behind the rack-mounted HIGHWIRE Longstars in the same 1U space, thus saving rack space.